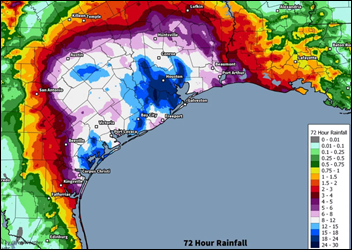 Southeast Texas continues to be hammered by the stalled remnants of Hurricane Harvey, which has already dropped 25 inches of rain on Houston and continues to linger over the state in what could be the most expensive natural disaster in US history. Rivers exceeded their historic high-water levels by as much as 10 feet. At least five people are known dead, but the toll will certainly rise when conditions allow the storm’s damage to be assessed. Several hospitals evacuated patients or closed. Driscoll Children’s Hospital in Corpus Christi air transported 10 NICU babies to a hospital in Fort Worth, fearing that a power outage would disable their ventilators. 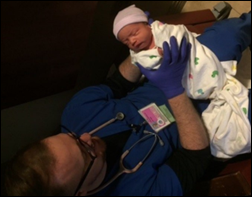 Five of 11 Memorial Hermann hospitals in Houston reported spikes in newborn deliveries, with barometric pressure changes doubling the usual number of births in some hospitals. 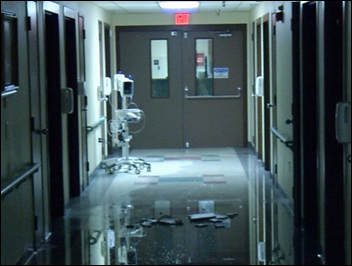 Several Houston-area hospitals closed the flood doors they had installed after Tropical Storm Allison in 2001, hoping to protect their basements and ground floors. 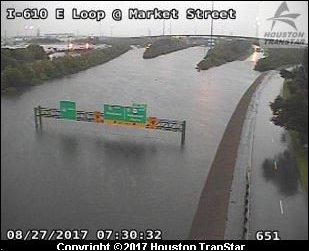 MD Anderson closed its campus and advised employees and patients to stay home Sunday morning due to impassable roads, with on-site staff assigned to remain at work until conditions improve. Clinicians at DeTar Hospital Navarro volunteered to stay at the hospital instead of at home with their families. 911 lines were jammed as families in danger took to Twitter seeking rescue from anyone nearby. 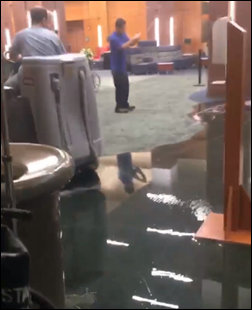 Behrouz Zand, MD posted this picture of MD Anderson’s lobby on Twitter. This Twitter-posted photo is of Aransas Pass Care Regional Medical Center, which was heavily damaged when its roof blew off, after which it was burglarized. 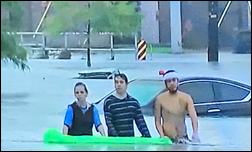 A Twitter user reported that these guys walked five miles in the water to respond to a Twitter plea for a help from a family with a sick baby. The mother of a baby delivered as the storm approached land at Corpus Christi Medical Center Doctors Regional decided to name the boy Harvey. From Gladiolus: “Re: The Advisory Board. After information leaked out in July about the company’s split and UnitedHealth Group purchasing the consulting side, no further public information has been provided.” The company said in its August 8 earnings call that it would not comment on the board’s strategic review process. ABCO shares dropped sharply after the earnings miss, but they’ve still kept pace with the Nasdaq index over the past year. The results of last week’s poll are interesting, although IP address analysis doesn’t inspire much confidence in their validity. New poll to your right or here: which backgrounds entitle someone to call themselves an “informaticist?” I ran a similar poll in 2010 and it stirred up quite a bit of discussion, such as whether a nurse doing EHR implementation and support work is an informaticist. 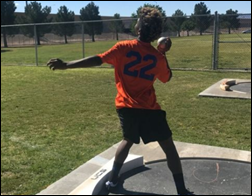 HIStalk readers funded the DonorsChoose teacher grant request of Nevada middle school PE teacher Mr. H, who asked for shot puts and relay batons so the track and field team can practice for meets. Thanks to these companies for their recent support of HIStalk. Click a logo for more information. The systems of two West Virginia hospitals go down in a malware attack. 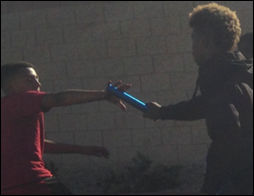 The Department of Defense pushes back its first scheduled go-lives of MHS Genesis. Apple tightens App Store requirements for health-related apps. SAIC announces that it will split itself into two publicly traded companies. ONC says it will not allow EHR vendors to drag their feet in supporting data exchange with competing EHRs. HL7 announces that it will make its standards available at no charge to increase their use. Technology investor Vinod Khosla says computers will eventually replace 80 percent of doctors. MedAssets files for its IPO. A lawsuit brought against McKesson for its involvement in setting inflated drug cost benchmarks is certified as class action. The builder of Epic’s $100 million, 5,300-seat learning center posts photos of the project online. HIMSS offers its second Virtual Conference. Misys gave away a car a couple of times. Created buzz, not sure if it created sales. The most memorable I’ve seen is when Medicomp launched Quipstar – I think at HIMSS 2011. There was a tremendous amount of buzz. Of course it also helped that they helped sponsor HIStalkapalooza that year. HIMSS Orlando 2017 Watson. Simple, bright booth with actual physicians and researchers demonstrating their work throughout the day. The individuals around the booth were knowledge, including marketing representatives, not just hourly booth babes. Admittedly, they can’t all be like this as the distraction of infotainment, gadgets, and snacks is occasionally welcome throughout the day. Epic’s cartoon books and tights-wearing WebMan. Iatric had a magician at a trade show who was quite memorable for his tricks and demeanor. Richard Simmons at the booth for a “Thin Client” promo for either IDX or Cerner. Way back in the late 90s. The urinal screens with advertising by ???? Guess it wasn’t that effective over the really long term. What, four years ago? Cold-emailed me to offer me shots at the bar! A Vermont-based vendor offering cans of Heady Topper, which is one of the top IPAs in the world and accessible only within a 25-mile radius of Waterbury, VT.
Can’t beat the OnBase Bar in the middle of the vendor floor. Ivo Nelson’s Pub Night. Long after the show floor is closed, the dinners and parties are over, most in the know head to Ivo’s pub night. An informal gathering to see old friends and build new relationships. Much work gets done. Years ago Arthur Andersen distributed jazz CDs at HIMSS in New Orleans. I still play the CD today and it’s loaded on my mobile devices. HIMSS itself, conducting the annual Interoperability Showcase. This week’s question: who is the most inspirational health IT or healthcare person you interact with regularly? CliniComp files a bid protest with the VA for choosing Cerner in a no-bid contract. A reader calls attention to Care Otter, which is apparently an Allscripts project to develop a new EHR, after which Care Otter’s web page, Twitter account, and YouTube channel are taken down. Investment research firm Hedgeye speculates that the new, unnamed six-hospital Allscripts Sunrise customer is Verity Health, owned by Allscripts investor Patrick Soon-Shiong. HIMSS Analytics provides detailed information on inpatient EHR market share by hospital count, total beds, and the number of physician users. Philips will create a Nashville health technology center that will add 800 jobs. Roane Medical Center (TN) will switch from McKesson to Cerner in 2018. 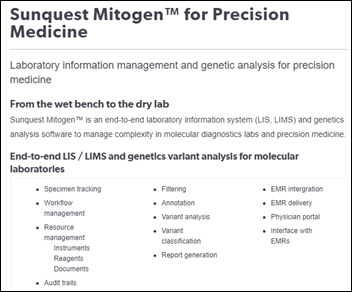 Sunquest announces GA of Mitogen, a laboratory information management system and genetic software suite for molecular diagnostics and precision medicine. 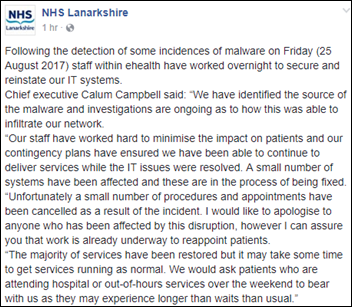 In Scotland, NHS Lanarkshire urges people with non-emergent conditions to avoid its ED due to a malware incident that has taken its systems down. The same trust was hit hard by the WannaCry ransomware this past May. 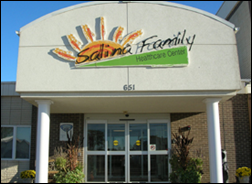 Salina Family Healthcare Center (KS) notifies 70,000 patients that its computer systems were infected with ransomware in June. Afterwards, a patient who hadn’t been seen there for 13 years complained that his records should have been purged and that outdated addresses on file means the breach notices will be sent to the wrong people. 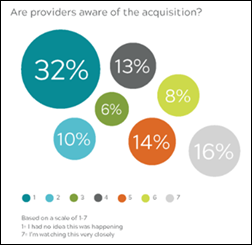 A new Reaction report covers the Allscripts acquisition of McKesson’s EIS business. The report finds that McKesson already had a high rate of users interested in replacing its systems, a process that may speed up with the acquisition. Epic CEO Judy Faulkner makes the “Forbes Richest People in Tech” list, coming in at #73 with an estimated net worth of $3.4 billion. Rishi Shah, the 31-year-old CEO of waiting room advertising company Outcome Health, was #69 at $3.6 billion. Lloyd Minor, MD, dean of Stanford’s medical school, blames EHRs for physician burnout and says that they (along with shorter office visits) “turn medical practice into a regimented, one-size-fits-all endeavor.” He says EHRs should add diagnostic support functions and use speech recognition, while doctors should use scribes to free up their time. 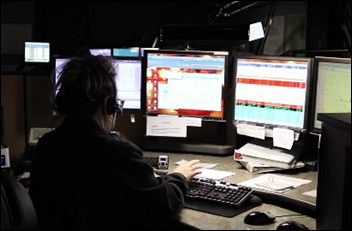 The Las Vegas paper covers the fire department’s deployment of RNs to staff its emergency call line for less-urgent medical calls, where the nurses follow software-driven to decide whether to roll an ambulance or to call Lyft to take the caller to a hospital or urgent care center. The pilot project’s return on investment might be questionable – nurses work from 9 a.m. to 6. p.m. and take just six calls per day, costing $300,000 per year. In Australia, a cancer survivor blames the lack of interoperability between the EHRs of two hospitals for her missing follow-up visits. A member of parliament says he has received several complaints that Sunshine Coast University Hospital cannot access patient histories since it does not use the state-wide, Cerner-powered IEMR system and instead uses a scanning-based system while it plans its transition to IEMR. Weird News Andy can’t visualize why some clueless eclipse-watchers who weren’t able to get protective glasses decided that their next-best option was to put sunscreen on their eyeballs. ZeOmega’s Jiva population health management platform earns NCQA certification. Experian Health will exhibit at AAHAM California August 27-30 in Rancho Palos Verdes, CA. Patientco recognizes Houston Healthcare (GA) as its Client of the Quarter.